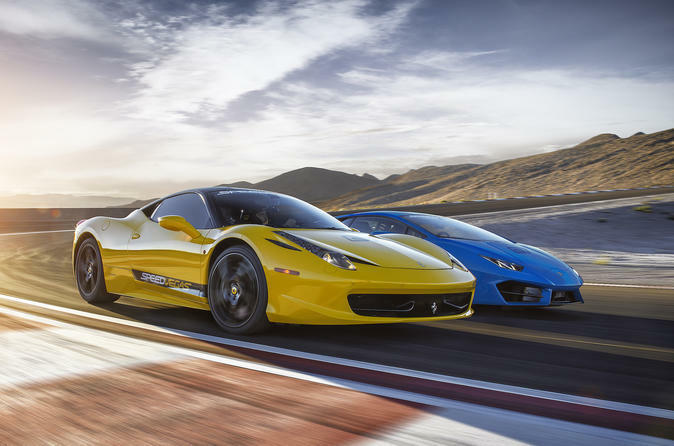 Get your adrenaline going during this exotic car racing experience from Las Vegas. Choose from an incredible selection of Lamborghinis, Ferraris, Porsches and more before getting in the driver’s seat and taking the wheel. The thrilling 1.5-mile, Formula One-inspired racetrack is totally private and just 10-minutes away from downtown Las Vegas. Don’t miss this opportunity to drive the car of your dreams on one of Sin City’s greatest racetracks. After heading just 10 minutes from downtown Las Vegas you’ll arrive at the race track on South Las Vegas Boulevard, where the first order of business is picking out your car. Choose from a Lamborghini Gallardo LP-550, Lamborghini Huracan LP 610-4, Ferrari 458 Italia, Porsche 911 GT3, Porsche Cayman GTS, Audi R8, Mercedes AMG GT-S, or Nissan GT-R. Your arena is a 100-acre ‘speed complex’ that features observation decks, a cafe, meeting spaces, a multi-level welcome center and event area that can accommodate thousands of visitors. Inspired by Formula One racetracks, this track features rising elevation changes, sweeping turns and a half-mile straightaway. Choose your car, check out the racetrack and take off at top speed for the drive of a lifetime. The course can be full-lit for after-dark experiences and isn’t far from the world-famous ‘Welcome to Las Vegas’ sign. Don’t miss this chance of a lifetime to test cars in exotic Sin City on one of the best racetracks in the area.